As previously reported, to celebrate and commemorate the 30th Anniversary of Whitensnake’s multi-platinum Slide It In album, Frontiers Music Srl has released Live In ‘84- Back To The Bone, a complete celebration of the group’s awe inspiring touring lineup during what many feel was the beginning of what Coverdale called his desire to make Whitesnake more “electrifying: on record and on stage. Released on Deluxe CD/DVD and stand-alone DVD editions, fans can order the release from Amazon.com. Click here to purchase the CD/DVD and here for the DVD. 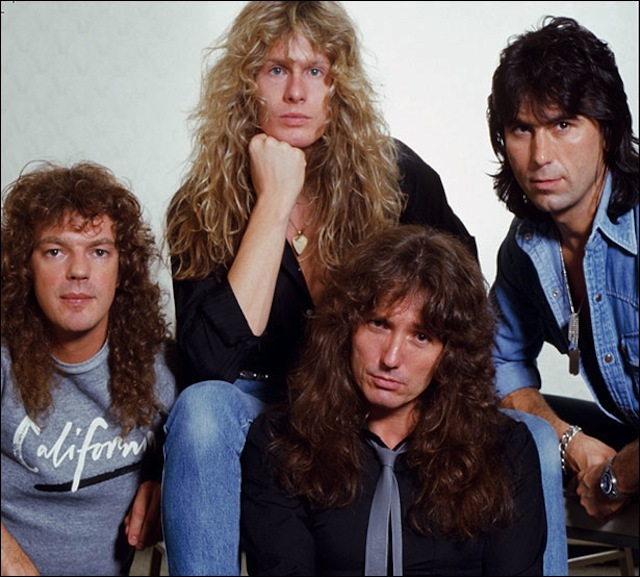 The Live In 84 CD and DVD release features audio and video recordings, unheard demos and unseen photos from the private collection of Whitesnake leader and vocalist, David Coverdale. This release offers an ultra-rare collection of material, performed by the band’s acclaimed 83-84 line-ups. Featured on the record are the awesome Cozy Powell on drums (ex- Jeff Beck Group, Rainbow, MSG and later on Gary Moore and Black Sabbath, among others), unique virtuoso guitarist John Sykes, whom Coverdale credits with inspiring a whole generation of six stringers after his breathtaking work on the Whitesnake ’87 album, and Bassist extraordinaire Neil Murray. To put this together, Coverdale and Co-Producer Michael McIntyre launched a worldwide search for the best quality video footage and audio tracks from the 1984 tour. Among the gems found was a set from: Super-Rock, recorded at the first Japanese rock festival at Seibu Stadium in Tokyo and an invaluable video of Jon Lord’s final appearance with Whitesnake recorded live in Sweden. “All of the features on this package have been treated lovingly & respectfully, with no expense spared, utilizing technology to improve sound & picture quality,” says Coverdale, who personally oversaw all elements of this release. DVD Bonus Gallery – Slide It In Slide Show with Rare Unseen Photos – The music bed contains snippets of private demos from David’s personal archives. I’m guessing like everyone else in 1984, these guys were doing enough blow to take down a rhinoceros. I haven’t heard of this bass player, but I’m sure he’s very good. I’m expecting some solid heavy blues rock (which I love) and a very tight band with some blazing guitar work by a young John Sykes (Who for some reason in his early interviews, makes me think of Nigel Tufnel). Cozy Powell !! Now there was a drummer !! T, you’ve never heard of Neil Murray, he’s only been with the snake since oh, ’78, the 1st album Trouble thru the Whitesnake album, not to mention Sabbath(late 80’s version) . Maybe you’ve done a little powder, trip, smoke or booze yourself and your mind is a little clouded lol. Neil Murray is a legend in the hard rock/metal world. If you’ve never seen the ’84 ‘snake show(I have’nt myself yet) check out Mr. Murray’s bass intro to Sabbath’s When Death Call’s on the 89-90 headless Cross tour. It will drop your jaw.